Today has been one of the most Monday Mondays in a whole lot of Mondays. Did that sentence make sense? I'm honestly not even sure anymore... Today is a whole other new discovery and this time it's the boutique style site - Trouva. They have a really interesting selection of things so I definitely recommend taking a look! 1. 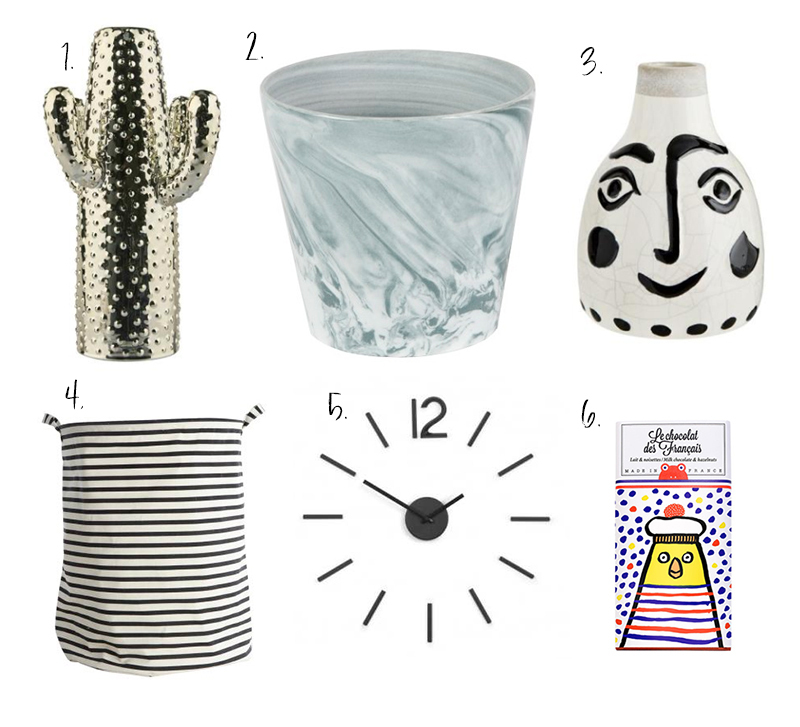 Miss Etoile ME Large Gold Ceramic Vase £37.95 [x] : How gorgeous is this cactus vase? Thought I was over the cacti life but apparently not. 2. Sass & Belle Marbled Planter £13.00 [x] : Another cliche trend, but I just think this is the loveliest marble colour. Plus it's pretty affordable too. 3. Madam Stoltz Mademoiselle Marietta Vase £35.00 [x] : Most of all I love homeware pieces that make me smile and this does just that. So sweet. 4. House Doctor Large Stripey Laundry Storage Bag £15.00 [x] : A basic, but a very pretty basic... I'm in love with this cute stripey laundry bag. 5. Umbra Minimal Black Blink Wall clock £30.00 [x] : If you want to go all minimal then I suggest this chic wall clock. How cool does it look? 6. Les Chocolate Des French Gourmet Chocolate with Caramelised Hazelnuts £5.95 [x] : I can't vouch for the taste of this chocolate but wow is the packaging cute. Want, want, want. I am currently obsessed about indoor plants so that marble planter really caught my eyes!